When you’re in North Carolina and you ask for barbecue, you’ll get pulled pork with vinegar sauce. When you’re in Kansas City, you’ll get sweet pork spareribs. When in Memphis, it’s dry or wet tangy sweet baby-back ribs. When in California, you’ll get salty garlicky beef tri tip. 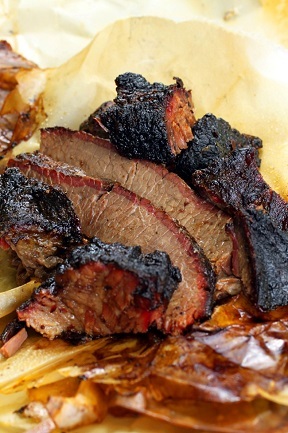 When in Texas, you’ll get Texas-style brisket. In my travels across the barbecue states I’ve always been impressed by the diverse barbecue traditions and styles of this only true and authentic American food. During the 2012 Christmas break I had a great time eating my way through over a dozen barbecue joints in Austin, Texas]. I wanted to return to Texas as that was where my first blush with American barbecue began when I arrived in Lubbock, Texas, as an international student in the early 1980’s to attend Texas Tech University. My classmate took me out for some brisket and I fell in love with Texas-style barbecue brisket. Brisket in Texas has a distinctive smokey, salty, and peppery flavor that will melt in your mouth and transport you to beef heaven. That experience left an unforgettable memory and I spent the next 20 years trying to replicate that magical first bite. As a professional pitmaster since 2008, I’ve cooked my fair share of first place briskets in KCBS, IBCA, and PNWBA sanctioned contests. In 2010, I was pleasantly surprised that I won first place in the nation in the 2010 KCBS Ranchers Reserve Brisket Cup Grand Championships. My 2012 trip to Austin rekindled my taste buds for Texas-style beef brisket which is quite different than the briskets I’ve cooked and won on the West Coast (CA, AZ, NV) contest circuit. For example, I’ve done well on the West Coast by saucing my brisket but I suspect the practice would be frowned upon in Texas as I did not taste any sauce on briskets during my Austin barbecue crawl. I’ve also notice that the California flavor profile leans towards spicy flavors while Texas has more peppery nuances. 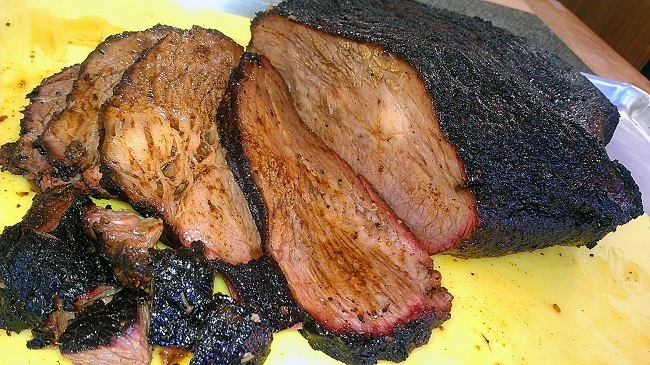 In this article, I share my version of a Texas-style brisket recipe which uses no brisket injection. Instead of aluminum foil, the brisket is wrapped in pink butcher paper which seems to be a page (pun intended) taken from the French en papillote technique of cooking in parchment paper. 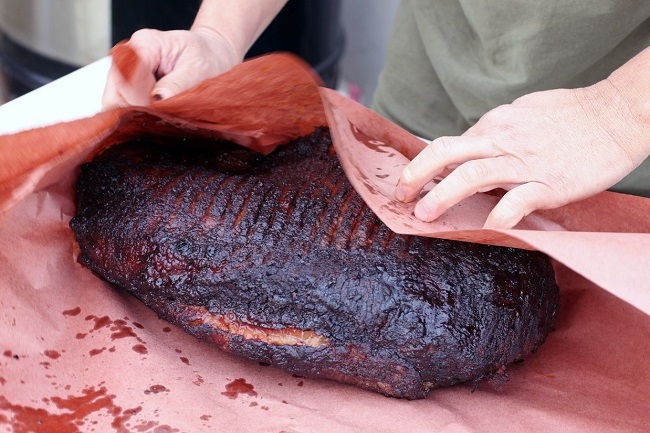 When I talked to pitmasters in Texas about their use of butcher paper, I got the impression that they felt butcher paper was superior to aluminum foil as it allowed the brisket to “breathe” better. This resulted in a crust that was crispier than the somewhat soggy crust resulting from foiling. Also, the oil from the brisket coats the paper and forms and water tight seal so the juices don’t leak out. 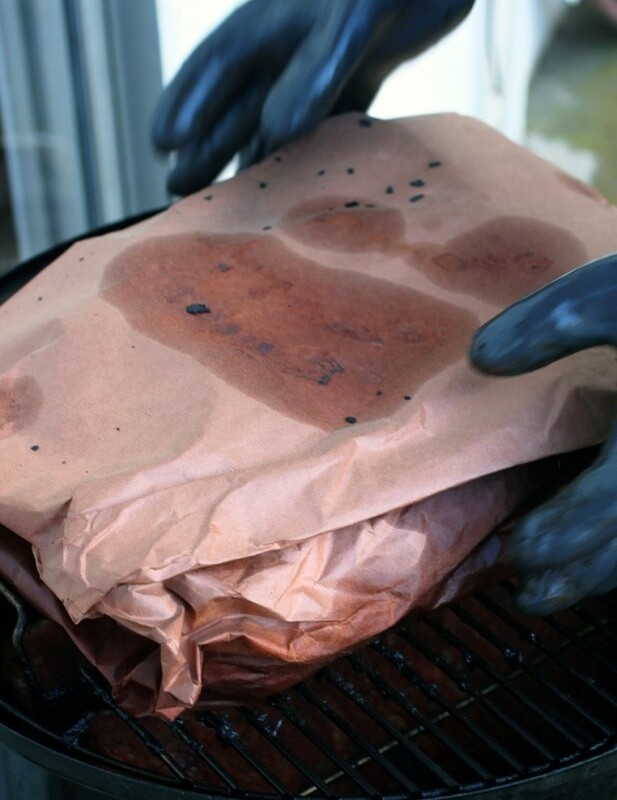 The butcher paper also minimizes over-smoking and also helps to keep the brisket moist. Whether you use regular brown or white butcher paper is up to you but I went the extra mile to order pink butcher paper from Amazon.com because I wanted to stay true to the Texas technique. Trimming is also minimal as it’s common to serve the charred beef fat with the brisket meat. You can ask for lean which is the flat slice with the fat cap attached or the fatty brisket which is the point with the fatty bits attached. There is a special searing phase in my recipe where you char the fat to get that special Texas brisket flavor. Regardless of which cuts you prefer, the Texas-style brisket is always smokey, salty, and delicious! It should look charred like a meteorite. Put the brisket fat side down in the pit. After about 6 hours and when some bark has begun to form, spray copiously with tap water from a spray bottle. Increase the temp to 250°F. Continue to spray every 20 minutes. When the crust has formed all over the brisket (about 2-3 hours later), increase the temp to 300°F for 30 mins to sizzle the bottom fat cap. Lower your pit temp to 250°F and cook until the paper-wrapped brisket it is probe-tender (about another 2-3 hours). I opened the paper pouch and used a thin bamboo skewer to check for tenderness. Remove at the level of doneness and tenderness you like. Open the paper pouch to vent the excess steam. Allow to rest until the internal temp is 170°F when measured by an instant read thermometer. Spoon the au jus onto the top of the brisket before you cut into pencil-thick slices. Serve immediately. Enjoy! Wrapping in pink butcher paper ala Texas-style! I agree with you Harry as I have been to Austin many times and yes that thick barked crust is to die for. Aaron Franklin pointed that out in BBQ Pitmaster shoss also. Funny you should mention the usage of butchers paper to wrap the brisket in. I was watching the show that Diva Q now has and she was in Austin and one of the places she visited did have their briskets wrapped in paper. Another place had their briskets on cardboard in the pit – now that was very interesting – what the heck would the cardboard do? As for the sauce versus no-sauce, I prefer the flavor of the meat without the sauce – as you have pointed out, the aujois from the brisket is most heavenly and sauce really covers up the beautiful flavor of the meat. Rod Gray has shown this to be true in his competitions. However as we know, sometimes sauce is what the judges want and helps pay the bills. What is the biggest brisket you could probably fit on a WSM 18? Should I trim the edges of the brisket if it overlaps the extent of the water bowl or touches the metal lid? That price is pretty high for a packer. Are you sure it wasn’t a trimmed flat? Just picked up a Prime packer from Costco for $3.39/lb. I live in orange county. Where can I get the pink butcher paper?? Good luck and send me pics! What is the meat internal temp when you take off pit? Everything I read says to smoke until it reaches between 190-205. Do you have any tips for smoking it on a WSM 22.5"? I’m not a time and temperature cook. I cook based on the feel of the meat as this is much more accurate as every animal will become tender at different temperatures. The temp by which meat is tender is also dependent on the cook temp and duration, as well as type of pit, airflow dynamics, and pit infrared reflectivity index. In general, the lower and longer you cook your barbecue meats, the lower the final temp will be. Alternatively, if you cook hot and fast (>275F) your final finish temp will be higher. My "feel" technique results in a more consistently tender end-product. There was no mention of smoke wood. Mesquite? Oak? Much love on all the success. Your method for brisket is straight forward enough on a bullet. However, it seems a bit cumbersome for large pits where multiple cuts are being smoked at once. I’ve got a larger offset with six rotating racks. I want to "Set it and forget it"…within reason of course! Additionally, hard to do if planning for an overnight smoke. Suggestions? I’m using the WSM 22.5" smokers. If I’m smoking 2 briskets can I put 2 briskets on the top rack or not or 1 brisket per smoker? Either way works as the 22 has plenty of real estate on the top and bottom grate. You can put two on top and two on bottom. Or one on top and one on bottom. Remember that the temp on the top grate is hotter though (about 5-10 degrees F). Remove the point after the brisket is cooked and cook for another 30 minutes to render more fat. Wrap in foil and add some water to rehyrdrate the point. Cut into cubes and sauce a bit if you like. Hi again Harry! Quick question – I’ve never smoked brisket before, but have smoked pork, using your recipe. I called the local market here and asked what they charge for CAB brisket, they said, $6.99/lb? Does that seem correct? I found that the grease from the brisket will soak through the butcher paper. 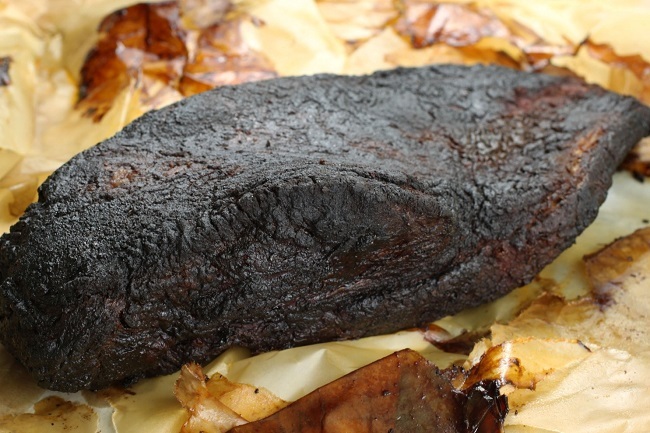 Wrapped brisket will not have crispy bark as the purpose of the wrap is to soften the hard bark. If you want hard bark, you’ll have to cook it unwrapped until the brisket is tender which may cause it to dry out. When I compete, I use foil and hold my brisket in my Cambro. I finish cooking my brisket at 7 am and like to hold for 6 hours before turn-in. I got the chance to try my hand at my first brisket this weekend. I was doing a test run on before I cook a big packer brisket for a 4th of July party. I followed a modified version of your recipe as my brisket was only about 5lbs. I was never able to get the bark to set for some reason. Was this because of the three hours at 200 was not enough time for bark formation, or was something wrong with the rub? Anyway the taste and tenderness was spot on at 6.5hrs on the smoker with the last two being wrapped in butcher paper. The meat was juicy, tender and flavorful. Thanks again for putting these recipe’s online for guys like me who are new to the BBQ game and can now use award winning and wonderful receipes to learn off of. I think 200F is too low to set the crust so try cooking at 250F or 275F to set the bark/crust. Good luck and send me pics to post of FB. I also use a WSM. Why fat side down? All ready to cook a Brisket tomorrow. A little concerned about the butcher paper, I got regular brown from the market it appears to have a waxy side Won’t this melt on the smoker? The pink butcher paper I use is unwaxed. I’ve not used waxed paper. When in doubt, use some foil. sounds great, can’t wait to try it.. has to wait, temps outside are n the snigle digits right now. You don’t let the brisket rest for 2-4 hours? Or should I say is it better to let it rest? And how long?